Sunset Point, Arizona—Seven people sustained injuries in a rollover crash on Monday that occurred on I-17 near the Sunset Point rest area. Some of the injuries have been described as serious. 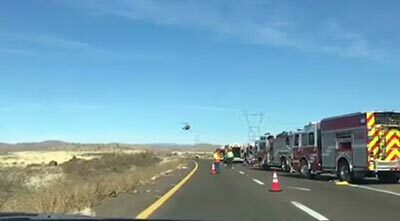 The accident was investigated by the Arizona Department of Public Safety and occurred near milepost 254 on I-17. Emergency responders with Daisy Mountain Fire Department arrived on scene and reported that three of the victims were children. Three people were air-evac'd to the hospital. We wish speedy and complete recoveries to those injured in the crash.